JustFlowers.com is also a great online site if you’re looking to send flowers across the way. 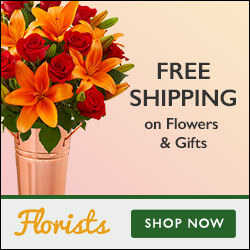 Valentines Day is coming up and Justflowers.com is a great site to get a wide varity of flowers! They offer wonderful bouquets if you are looking for something different. Here are some examples of perfect arrangements for this Valentines Day! Love Enchantment Bouquet: Pink Roses, Orange and Pink Carnations, and Daisies. It is so full and beautiful and just the right color that says love! Pink Love Lilies: 4 Stargazer Lilies with Limonium. Simple yet very elegant. They also have many different bouquets of Roses as well in all different colors and sizes. Delivery is quick and ordering is simple with JustFlowers.com! Whatever you chose will turn out excellent and your loved one will be sure to be happy.